Congratulations On The Establishment Of China Transport (Yantai) Intelligent Technology Co., Ltd.
Summary: On July 17, after the strict review by the State Administration for Industry and Commerce, China Transport (Yantai) Intelligent Technology Co., Ltd. successfully registered. 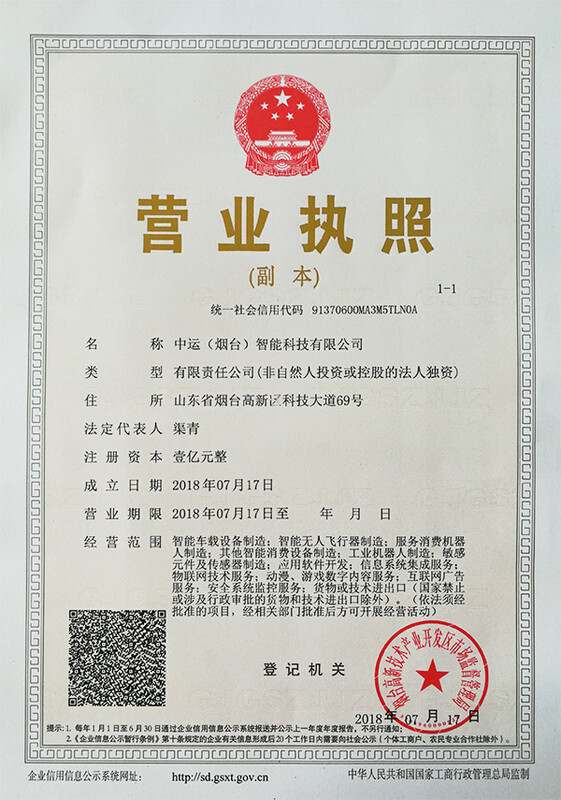 On July 17, after the strict review by the State Administration for Industry and Commerce, China Transport (Yantai) Intelligent Technology Co., Ltd. successfully registered. As the main company of the key investment attraction project in Yantai High-tech Zone, in the next three years, China Transport Intelligent Machinery Group will invest 600 million yuan, covering an area of 95 acres, build a “smart manufacturing + cross-border e-commerce industrial park” that integrates “Intelligent manufacturing, commodity trading, industrial services, logistics and distribution, exhibition and exhibition, e-commerce training, business office and comprehensive support. China Transport (Yantai) Intelligent Technology Co., Ltd. is a modern high-tech enterprise integrating R&D, design, production, sales and after-sales service. The company's main business scope includes the manufacture of intelligent vehicle equipment; the manufacture of intelligent unmanned aerial vehicles; service consumer robot manufacturing; other smart consumer device manufacturing; industrial robot manufacturing; sensor and sensor manufacturing; application software development; information system integration services; Internet of Things technology services; animation and game digital content services; Internet advertising services; security system monitoring services; import or export of goods or technology. The registration of the China National Games (Yantai) Intelligent Technology Co., Ltd. marks the independent development of the high-end intelligent industry of China Transportation, and has officially entered the path of internationalization, marketization and industrialization. It has a positive role in promoting the innovation and transformation of products in the field of intelligent technology. The establishment of the company will accelerate the expansion of the global market and better promote the comprehensive realization of the strategic goals of the global brand of China Transport Intelligent Group! In the next step, the company will introduce the advanced intelligent technology development experience of China Coal Group, rely on the strong strength of the intelligent technology manufacturing field of China Transport (Yantai) Intelligent Technology Co., Ltd. and the strong industrial foundation of Yantai High-tech Zone, the superior environment and preferential policies for the development of intelligent technology, transform the China Transport Intelligent Industrial Park project into a professional “smart manufacturing + cross-border e-commerce industrial park”, make positive contributions to the rapid development of new and old kinetic energy conversions nationwide!